When I walked into the visitors’ clubhouse on Saturday, Ike Davis and Josh Thole were examining one of Thole’s new angled-knob bats. Thole told me it was designed to protect against hamate-bone injuries, and I pointed out that Thole choked up anyway and was an odd choice to be debuting the new bat design. During warmups the next day, several Mets passed one of the bats around, fascinated both by the oddly shaped knob and the bat’s finish. I snapped a picture of it a few hours before Mike Hessman used it on his pinch-hit double on Sunday, becoming the first Major League player to do so. The inventor of the angled knob, Grady Phelan, made his way here and was willing to answer a few questions about how the idea came about and how the bat works. Ted Berg: First off, how’d you get into the bat-design business? Grady Phelan: My youngest son, Brian, and I have a summer ritual of fungoing hickory nuts out of our backyard -– it’s great practice and makes for a fun afternoon. While we were hitting these green nuts into the woods the bat I was swinging slipped from my hands nearly hitting Brian. The knob had been digging into the palm of my hand, had left a nice bruise in my hand (similar to what you get from your first time in the cages every spring). That’s when I realized that the knob probably caused my grip to fail. I started to do research on thrown bats, hand injuries, anatomy and even started to experiment with bat designs to eliminate the problem. TB: So did you just get on a lathe and start crafting? I think even if I came up with a good idea for a better bat knob I wouldn’t know where to go from there. GP: I didn’t get a lathe at first. I had a local custom wood turner make a five or six bats that I could carve my designs into. It’s one thing to buy a lathe and try to turn a bat, it’s quite another to find quality ash and Maple that can actually be used to hit baseballs with. TB: And how did you finally settle on a design? How did you test the bats out, get feedback? And what are you using to produce them now? GP: I worked through an endless series of designs, testing in the cages with my son and refining each iteration. While I was doing that I also started researching patents on baseball bats to see what was out there. I did a lot of homework on rules that govern bat shapes for MLB and NCAA to ensure I didn’t create something that would be illegal. My thinking at the time was if I was going to do all this work I might as well try to protect my idea, so I submitted a patent application and then started testing the bats with players. The patent was issued this past June. I’m fortunate to know some college baseball coaches in the St. Louis area and they let me bring my bats to practice for the players to try. After each session in the cages I had them fill out a survey on the bats. 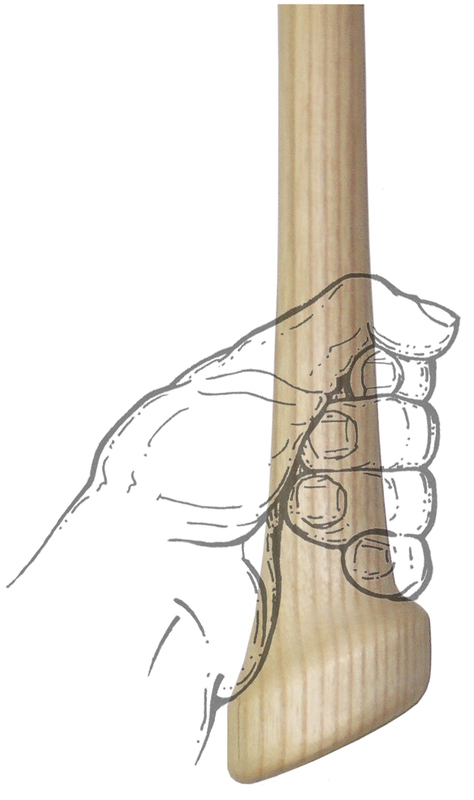 I’m currently working with Rock Bats, an MLB-certified bat company, to produce bats with my angled-knob design. It’s owned by the wood scientist who developed the MLB specifications for maple bats, Roland Hernandez. So not only is the wood these bats are made of the best, the performance of the bat in the players hands is designed to give them their best swing. TB: You mentioned in the comments that the bats give players “quicker hands, stronger swings, better plate coverage and reduced incidence of injury.” Is that the conclusion from those surveys, or is there more evidence pointing toward that? And do those benefits come just from the ergonomic design of the knob, or is there more to it? GP: The test results from the batting cages indicated players felt a number of performance improvements. Players said they could extend the bat better with more ease and control, they said they felt like they had quicker hands and that their swing felt smoother. As the data came in showing consistent responses from players at all levels, I began to think I had come across something new –- something every other bat maker had overlooked. The wife of a good friend is a professional hand therapist and university teacher –- I showed her the bats, told her my theories and explained my findings. Soon after that meeting I found myself in the physical therapy labs at Washington University School of Medicine, using digital pressure sensors to test the knob pressure on the hands of my bat and a standard MLB bat. The tests consistently showed a roughly 20% decrease in pressure to the base hand from the knob with my bat. So in fact, the ergonomics of the knob reduces the pressure to the base hand allowing a more natural and powerful swing to occur. Standard knobs cause what I call “The Speed Bump Effect”, at the point of contact with the ball the batter rolls his hands over the knob –- it’s this pressure point that causes broken hamate bones, thrown bats and weak swings. I believe batters have become accustomed the negative forces of the knob in their base hand and their natural swing suffers because of it. TB: I know that in addition to the knob, one of the things that seems to fascinate a lot of the Mets about Thole’s new bat is the finish, which is a bit rougher and harder than you usually see on Major League bats. Do you know anything about that, or is that all Rock Bats? Were you at all involved in the process of getting them to Thole, and are any other Major Leaguers currently using them or testing them out? GP: Rock Bats developed the proprietary Diamond Barrel finish on the bat that has the Mets talking –- it’s impressive technology and Rock Bats is the innovator on that one. It is all about developing technologies that players want to use. I got the bats to Josh in a round-about way. It goes back a few years when new neighbors moved in across the street. Their son and ours play baseball so we’re always talking baseball. His cousin, Josh Thole got drafted by the Mets, began playing Single-A ball and the connection was made. I sent Josh some bats over the years and he used them in batting practice. Now, I can’t take credit for his batting skills, but it is interesting that players who have used my angled knob bats have had the highest batting average on their teams at one point or another. You can’t just give someone bats to use in an MLB game, they need to be made by certified bat makers, which Rock Bats is. I met Roland early this past spring and we hit it off (pardon the pun). We made the bats, I let Josh know I would meet him in Chicago with the bats. So my son Brian and my wife drove to Chicago with the bats in the car and met Josh outside the clubhouse before the game. Other players using these Rock Bats are Cory Hart and Prince Fielder. The response to the angled knob and the finish has been surprising. I actually didn’t think anyone would use the bats right away. I was guessing it would take a few days in the cages for someone to get comfortable with it. And as you know, Mike Hessman is the first MLB player to ever use an angled knob bat in a game and he got a double with it. TB: Thanks so much, Grady. You can check out Grady’s website here or follow him on Twitter here. I had no idea bats could be redesigned. Do they need to be approved by Major League Baseball or somebody before they’re used in the Major Leagues? I don’t think its as much a redesign as an evolutionary step forward. Almost every bat is cupped now thanks to Jose Cardenal who introduced the first cupped bat barrel in 1972. All bats used in MLB games must meet strict MLB rules – see the bat rules section 1.10 -http://bit.ly/aUZHFp. I submitted my proposed knob designs to MLB in 2006 and received approval later that same year. It’s taken since then to build a relationship with a player and bat company to have this opportunity. I need to thank Josh for his efforts on my behalf. Great kid with a bright future. I’m not sure how you’d make a bat like that with a lathe, but then it’s been a long time since I last worked with a lathe.